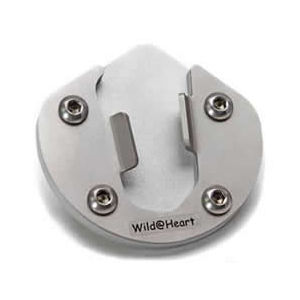 At Wild@Heart, we believe in quality, useful, hard-working and stylish gear and accessories to protect you and your motorcycle and to make your adventure riding safe, comfortable and exciting. 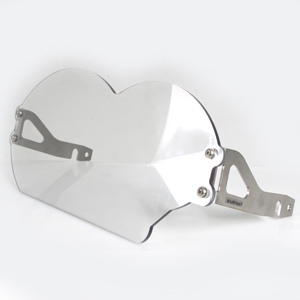 We love the design and development process and take great pride and enjoyment in manufacturing our own range of Wild@Heart accessories for adventure motorcycles, particularly concentrating on the BMW GS range of bikes. In addition, we take our time to research and source only the best international products to compliment and extend our own products, to provide you with a great selection of accessories for your motorcycle. As we travel and tour, we discover what products work best, which one's we need and the one's which serve no purpose whatsoever. Those ones, land in the bin, of course. Accessories should be compatable and adhance the motorcycle, it should be high quality, not interfere with the normal functioning and riding of the motorcycle and you should not need to drill or alter your motorcycle for the accessory to be installed or fitted. Have fun, be safe on the road, but hopefully always be a little bit Wild at Heart. Aluminium handlebar risers give the rider (especially taller riders) a more comfortable, upright and relaxed position on the motorcycle. When standing, there is less strain on the back, arms, shoulders and wrists of the rider. Some riders feel that it gives them better handling when riding off-road. Tools needed: Torx 45 and a 6mm Allen Key. 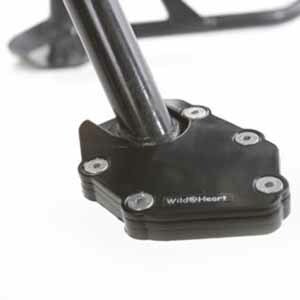 The Stainless Steel Wild@Heart Wider Rider Foot Pegs give the rider a firmer grip on the pegs, while riding through difficult terrain, mud and wet weather, reducing the risk of feet slipping off the pegs and/or falling. These pegs also make it more comfortable to stand over longer distances. The only tool you need for installation is a pair of long nose pliers! Fit the F650GS Dakar/Sertao, R1100GS, the R1150GS/A, R1200GS/A and now also the R1200GS/A LC. 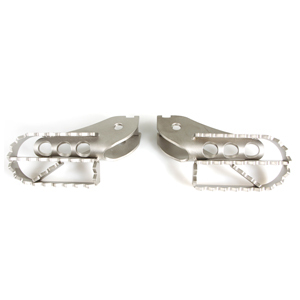 The stainless steel pillion foot pegs enable the pillion to have a firm grip on the pegs while riding through difficult terrain, reducing the risk of falling. 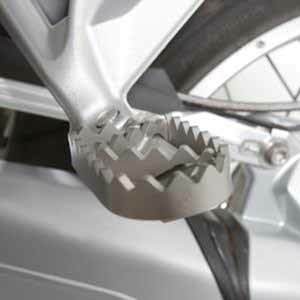 The pillion foot pegs also make it more comfortable for the pillion whilst standing for long periods. The only tool you need to fit the pillion foot pegs, is a pair of long nose pliers! 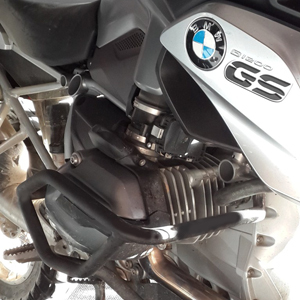 Set of 2 powder-coated Stainless Steel guards to protect the radiator of your liquid cooled R1200GS. Easy to install, no modifications needed to your motorcycle. You will need a Torx 25 to fit these guards. To help protect the expensive BMW headlamp against stones, branches and road debris. Easy to install, no modifications needed to your motorcycle. A Torx 25, Torx 30, 3mm & 4mm Allen Key and no. 8 Spanner needed for fitment. 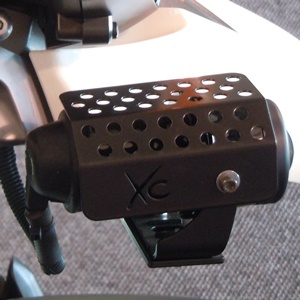 The Side Stand Switch Protector protects the very vulnerable side stand switch of the R1200GS LC against accidental damage, rocks and other debris encountered on an off-road ride, whilst enhancing the appearance of the motorycle. Use a Torx 30, 5mm Allen Key and Side Cutter to fit. 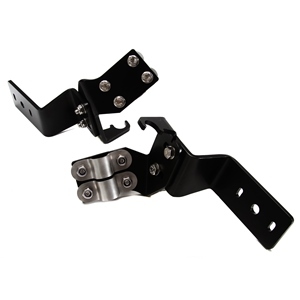 These wrap-around crash bars will protect the cylinder heads and engine of your motorcycle in the event of an accident. It is easy to install and no modifications needed to your motorcycle. You will need a T50 Torx and 6mm Allen Key for fitment. Fit the BMW R1200GS LC 2014+. A set of 7 Crash Bar Plugs to cover those ugly holes in the frame of your R1200GS LC. 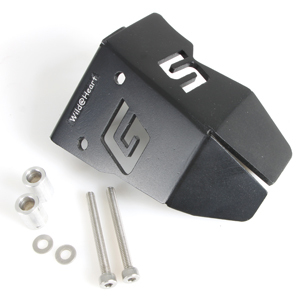 You will not believe the big difference a small item like this can make to the overall appearance of your BMW R1200GS LC motorcycle. Easy to install, no equipment needed. Fit the BMW R1200GSA LC 2014+. 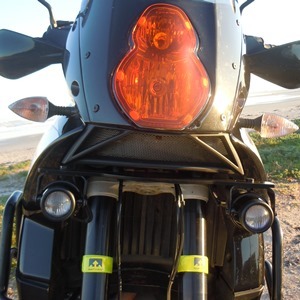 A set of 9 Crash Bar Plugs to cover those ugly holes in the frame and crash bars of your R1200GSA LC. 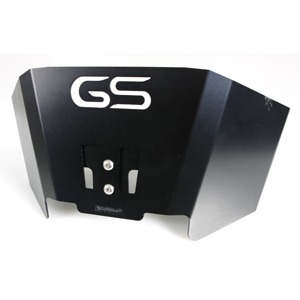 You will not believe the big difference a small item like this can make to the overall appearance of your BMW R1200GSA LC motorcycle. 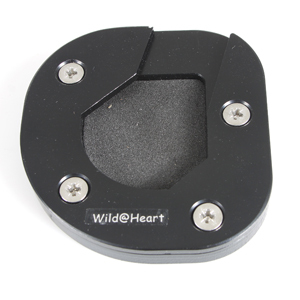 The Wild@Heart Side Stand Support is ideal for all those uneven surfaces where a flat rock is just nowhere to be found. This sturdy and strong aluminium enlarger will effectively support the weight of your adventure motorcycle. You will need a 3mm Allen Key and a bit of Loctite to install this product. The foot print of the K51 BMW R1200GSA is slightly different than the R1200GS LC, but do not fear, we have one available. The aluminium enlarger is sturdy and strong and will effectively support the weight of your Adventure on uneven and soft surfaces. You need a 3mm Allen Key and a bit of Loctite to install the side stand support. The adjustable rear brake lever makes it easier to engage the rear brake when standing whilst riding off-road. 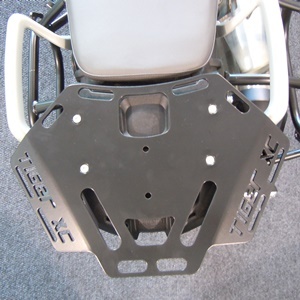 The top piece can be flipped up when riding on the road in a sitting position and flipped down when riding off-road in a standing position. A very nice addition to your 1200GS LC for the adventure rider in more technical sections. Two-Finger Levers give the rider more effective and direct access to the clutch and front brake when riding, without pinching the other two fingers when pulling the clutch. They are less prone to break when dropping the motorcycle and much more comfortable when riding more technical sections off-road. Also available in black. Product code: W007/4201 @ R2,350 per set. 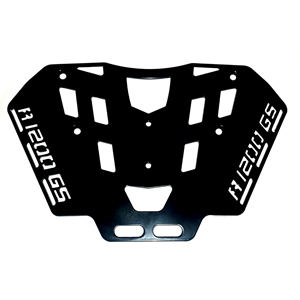 Fits the BMW R1200GS LC 2013+. 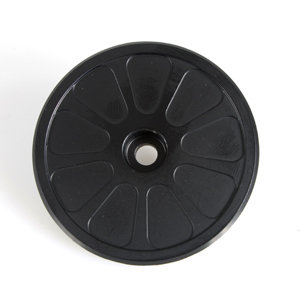 Manufactured from Aluminium with a black powder-coated finish. 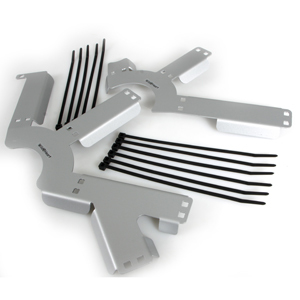 The OEM rack is very small and it is extremely difficult to fasten/carry a large tail bag securely. 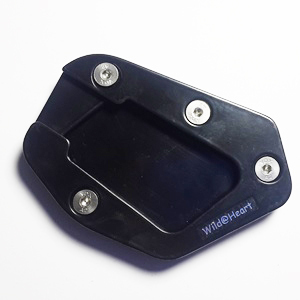 The Wild@Heart Luggage/Carrier Rack has been designed to fit a RotopaX mount to enable you to take extra fuel or water on your trip and still fit your soft luggage bag on top. These racks have been specifically designed to fit your Wolfman, Dakar Freedom, ATG or other similar saddle bags. They are easy and quick to fit on the R1200GS LC, and ensure very quick and convenient fitment and removal of your soft luggage. The side pannier frames also protect the motorcycle at the rear in case of a "Side Stand Incident". 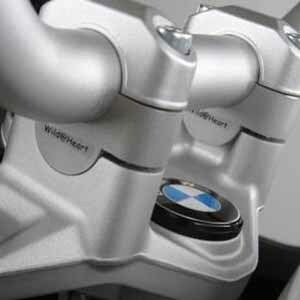 Fit the BMW R1200GS 2004 -2007 and the BMW R1200GSA 2006 Air-Cooled models. Handlebar risers give the rider (especially taller riders) a more comfortable, upright and relaxed position on the motorcycle. When standing, there is less strain on the back, arms, shoulders and wrists of the rider and it is therefore less tiring to stand for longer periods. 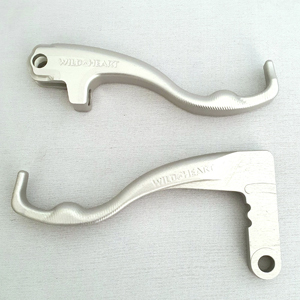 The Wild@Heart handlebar risers are manufactured from Aluminium. You will need a E10 External Torx – E10 ⅜’’ drive - and a 6mm Allen Key for installation. Fit the BMW R1200GSA 2007 Air-Cooled model. 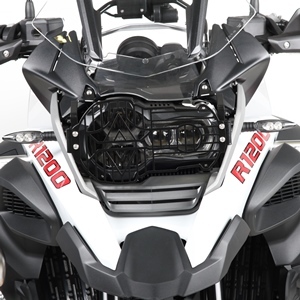 The risers are exactly the same as for the BMW R1200GS 2004-2007 models above, but have special manufactured, longer bolts to fit the 2007 Adventure with the fog light switch in the centre of the handlebar. These bolts make it possible to re-install the Fog Light Switch back in its original position. You need a T25 Torx and 13mm Ring Spanner to install the risers. Fit the BMW R1200GS 2008-2012 and BMW R1200GSA 2008-2013 Air-Cooled Models. 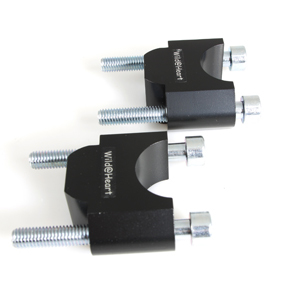 Handlebar risers give the rider (especially taller riders) a more comfortable, upright and relaxed position on the motorcycle. When standing, there is less strain on the back, arms, shoulders and wrists of the rider and is therefore less tiring. Some riders feel that it gives them better handling when riding off-road. 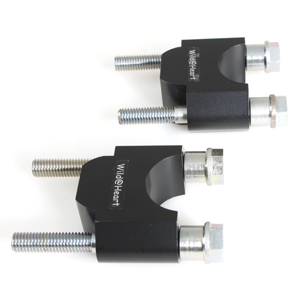 You need an External Torx 12 & 10 as well as an 8mm Allen Key to install this product. 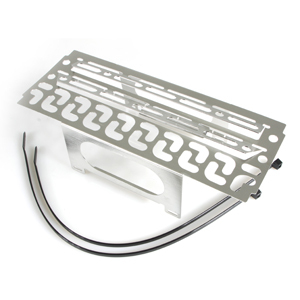 The oil cooler of the standard BMW R1200GS/Adv is unprotected against stones and insects which often get trapped in the oil cooler. One little stone hitting the oil cooler can easily bring your adventure ride to a quick end. 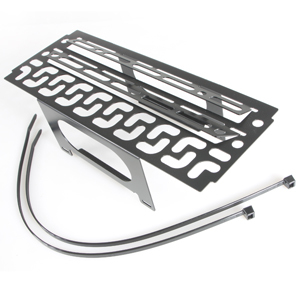 The oil cooler protector minimizes the risk of getting yourself caught in such a situation. A T25 Torx, T30 Torx, no. 9 Spanner and pliers are needed for installation. 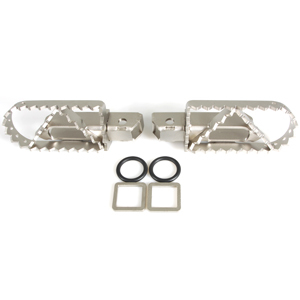 These Stainless Steel rider foot pegs give the rider a firmer grip on the pegs while riding through difficult terrain, mud and wet weather, reducing the risk of slipping off the pegs or falling. These pegs also make it more comfortable to stand over longer distances. Fit the BMW R1200GS 2004-2012 Air-Cooled, BMW R1200GSA 2006-2013 Air-Cooled. Also fits the F650GS Dakar/Sertao, R1100GS, R1150GS and the R1200GS/A LC. The only tool needed is a pair of long nose pliers. The headlight protector effectively protects the expensive BMW headlamp against stones, branches and road debris. The shield is made from polycarbonate and fitted to stainless steel brackets for optimum protection and durability. Tools needed for installation: T30 Torx, 2.5mm Allen Key & a no. 7 Spanner. Fit the BMW R1200GSA 2006-2013 Air Cooled models. The Spotlight Relocation Brackets are made from Stainless Steel and are designed to move the spotlights of the Adventure not only upwards, but also slightly inwards. 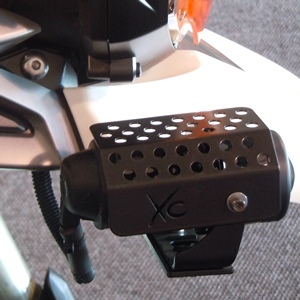 The relocation helps to prevent the spotlights from breaking off when having a side stand incident. Tools needed for installation: Torx 30, Torx 15, 10mm Spanner and a 4mm Allen Key. 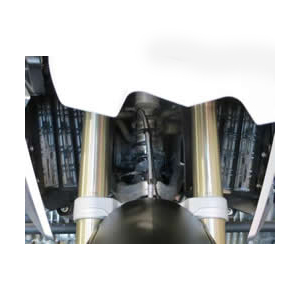 Crash Bars protect the cylinder heads and the engine of the motorcycle in the event of an accident. 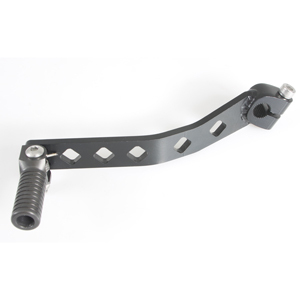 The Crash Bars is made from Powdercoated Mild Steel with 28mm outer diameter round tubing. A Torx 55, Torx 30, 10mm Allen Key, 8mm Allen Key and a 4mm Allen Key is needed for installation. The frame of the motorcycle is not protected against your riding boots which will soon scrape the paint of the frame. The silver frame protectors, made from Mild Steel, will prevent this from happening and give your motorcycle a sporty, finished look. Only a pair of scissors and a side cutter is necessary to fit the frame protectors. The frame of the motorcycle is not protected against your riding boots which will soon scrape the paint of the frame. The black frame protectors, made from Mild Steel, will prevent this from happening and give your motorcycle a sporty, finished look. 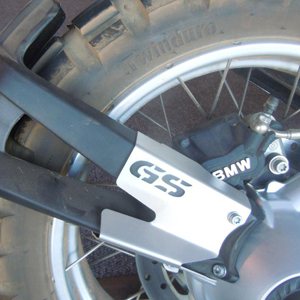 The Pivot Point Cover neatly and cleverly conceals the ugly hole on the side of your BMW R1200GS/A motorcycle. 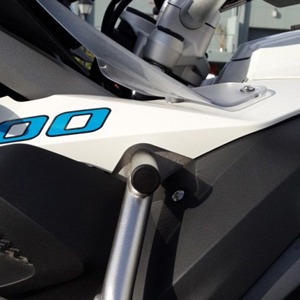 Choose silver to match the silver frame of the R1200GS. You need a Torx 30 for installation. Choose black to match the black frame of the R1200GSA. The Throttle Potentiometer Cover protects the Fuel Injection Connector on the left hand side of the motorcycle. 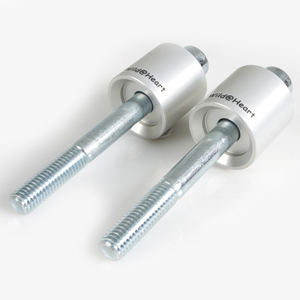 It is easily fitted with two Allen Cap Screws and two bushes (Supplied) and uses the existing holes on the motorcycle. 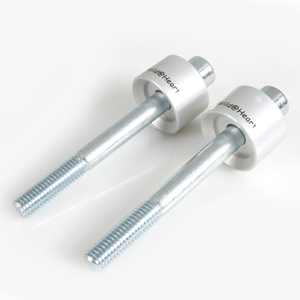 You will need a Torx 20 and 3mm Allen Key for fitment of this product. The Throttle Potentiometer Cover protects the Fuel Injection Connector on the left hand side of the motorcycle. The right hand side is well-protected and does not need a similar cover. 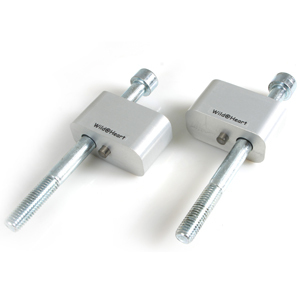 It is easily fitted with two Allen Cap Screws and two bushes (Supplied) and uses the existing holes on the motorcycle. You need a Torx 20 and 3mm Allen Key to install the cover. The adjustable gear lever provides more options for different feet sizes to give the rider optimum riding comfort. 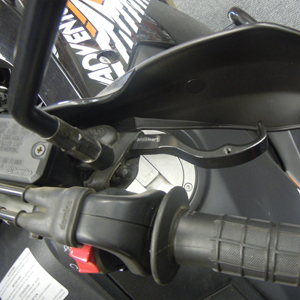 The spring loaded tip of the gear lever will reduce damage if the motorcycle falls over. It helps to protect the gear lever, shaft and transmission. 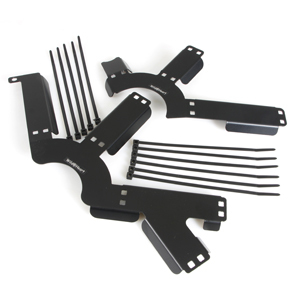 You need the following tools for installation of this product: E8 External Torx, 4mm Allen Key and a no. 10 Spanner. 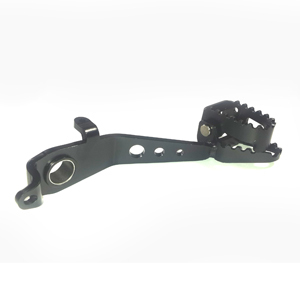 The top piece of the adjustable rear brake lever can be flipped up when riding on the road in a sitting position and flipped down when riding off-road in a standing position. A Torx 30 and Torx 40 Spanner is needed to install this product. The Two-Finger Levers give the rider more effective and direct access to the clutch and front brake when riding, without pinching the other two fingers when pulling the clutch. They are made from Aluminium and less prone to break when dropping the motorcycle and much more comfortable when riding off-road. Tools needed for installation: Torx 25, 8mm Spanner, Hammer, 8mm Drill Bit and a Flat Screwdriver. The cockpit cover fits underneath the windscreen of the motorcycle and covers the area between the tachometer and the headlight unit of the motorcycle. It completes the look of the motorcycle and also helps to prevent the glare coming back from the headlight. 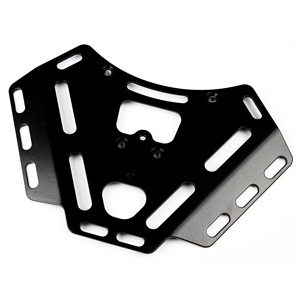 The Cockpit Cover is made from Powdercoated Mild Steel. Fits the BMW R1200GS 2008-2012 and BMW R1200GSA 2008-2013 Air-Cooled Models. The rear mudguard of the air cooled R1200GS/A has a lot of vibration, especially when riding corrugated or bad gravel roads. 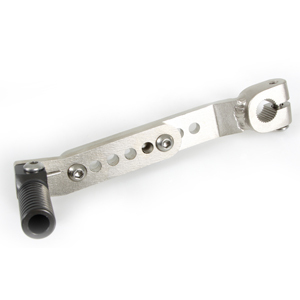 It creates friction on the inside bracket resulting in the bracket breaking and the bolt that keeps it in place to snap. 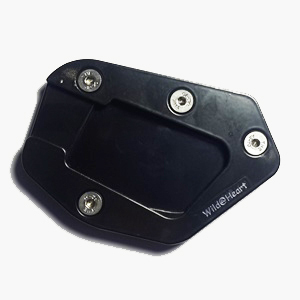 The Wild@Heart Rear Mudguard Support has an over-engineered bracket and the support section visible on the photo reduces the vibration and friction. 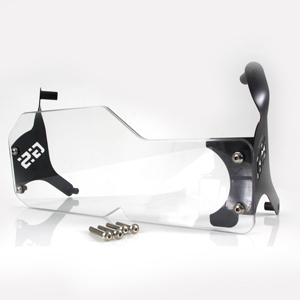 The Mudguard Support therefore supports the rear mudguard from breaking off. You need a Torx 30 and Torx 40 to install this product. Please note it does not fit the R1200GS with the lower suspension. If you need a bigger footprint to support the weight of your R1200GS/A when parking on soft or uneven surfaces when a flat rock is nowhere to be found, you do not need to look further. 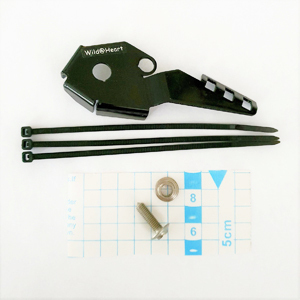 The strong and sturdy 3-piece design Wild@Heart Side Stand Support will effectively support the weight of your adventure motorcycle, even when heavily loaded. Fits the BMW R1200GS 2004-2007 and BMW R1200GSA 2006-2007 Air-Cooled models. If you need a bigger footprint to support the weight of your R1200GS when parking on soft or uneven surfaces when a flat rock is nowhere to be found, you do not need to look further. Fits the BMW R1200GS 2008-2012 Air-Cooled models. The black powdercoated aluminium rack has been designed to also fit a RotopaX mount to enable you to carry extra fuel/water on your trip and still fit your soft luggage on top of the fuel/water pack. Fits the BMW R1200GS 2004-2005 Air-Cooled models. 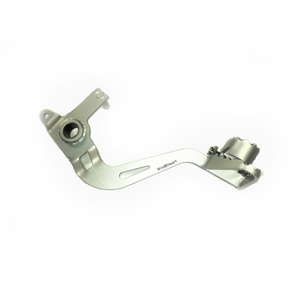 Easy fitment bracket for your LED spotlights or fog lights. Uses existing mounting points on the motorcycle. 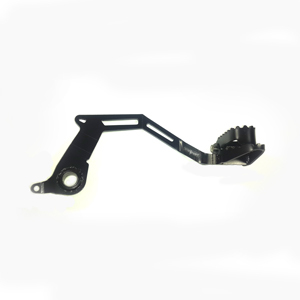 Fits the BMW R1200GS 2004-2012 Air-Cooled models. Great look and protection for your fog lights. Uses existing mounting points on the fog light bracket. Some riders feels that it gives them better handling when riding off-road. Tools needed: E10 External Torx, Torx 50, 8mm Allen Key, 16mm Spanner and Towel. 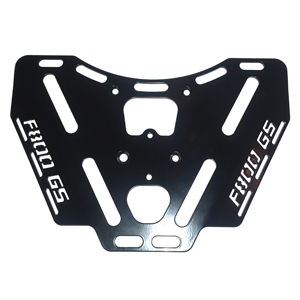 Fit the F650/700GS Twin (can also be used on the F800GS). 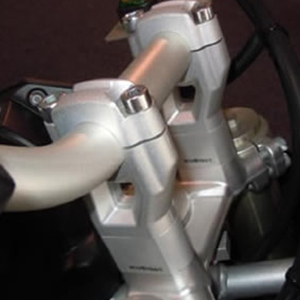 The 20mm handlebar risers give the rider of the F650/700GS Twin a comfortable, upright and more relaxed position on the motorcycle, without putting strain on the cables. When standing, there is less strain on the back, arms, shoulders and wrists of the rider. Some riders feel that it gives them better handling when riding off-road. 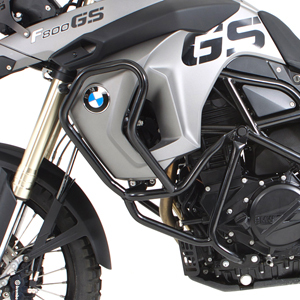 Fit the BMW F650/700/800GS Twin as well as the F650GS Dakar/Sertao, R1100GS, R1150GS and R1200GS Air-Cooled. 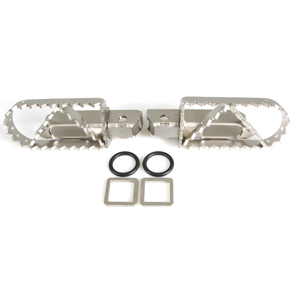 These Stainless Steel rider foot pegs gives the rider a firmer grip on the pegs while riding through difficult terrain, mud and wet weather, reducing the risk of feet slipping on the pegs and/or falling. The wider pegs also make it more comfortable to stand over longer distances. The tank of the F650/700/800GS Twin is wide at the back and can make it very uncomfortable for the pillion rider to stand. 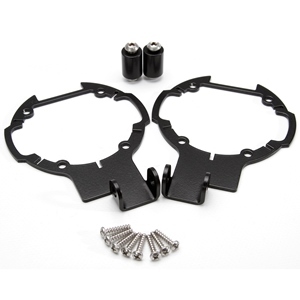 The wider pillion foot pegs allow for easier and more comfortable standing and sitting position for the pillion on your F800/700/650GS twin. You will need long nose pliers to fit this product. 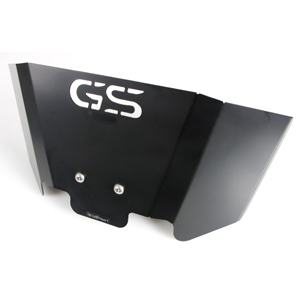 Fits the F650GS/700GS/800GS 2008-2012 Models. The headlight protector effectively protects the expensive headlamp against stones, branches and road debris. It is easy to fit and does not require re-adjustment of the headlight after fitting. The screen is made of Polycarbonate. You will need a T25 Torx and 3mm Allen Key for fitment. 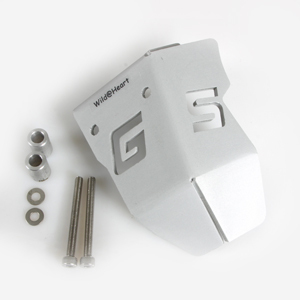 Fit the BMW F650/800GS 2008-2012 models. 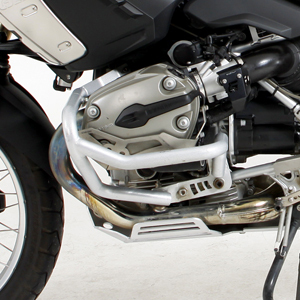 Crash bars protect the engine and radiator of the F800/650GS in the event of a "side stand" incident. The crash bars fit in perfectly with the lines of the motorcycle and looks like it is part of the frame, while giving excellent protection. The crash bars are easy to fit and covers the top and bottom part of the motorcycle. It will prevent major damage to the radiator after an accident. Tools needed for fitment: Torx 50, Torx 25, 6mm Allen Key, 10mm Spanner and a Flat Screwdriver. 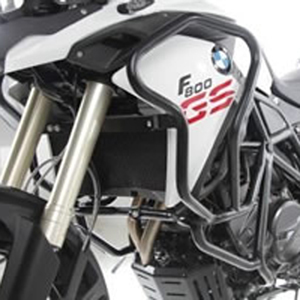 The F800GS 2013+ crash bar, like its predecessor, is aesthetically designed to follow the lines of the new F800GS whilst giving the motorcycle optimal protection. The crash bar comes up nice and high in order to help protect the upper side panels as well as the radiator. Installation of the crash bar is straight forward and takes approximately 15 to 20 minutes. The L-Shape brackets used to install the 2008-2012 model crash bars are now replaced by a cross-bar supporting the upper sections. 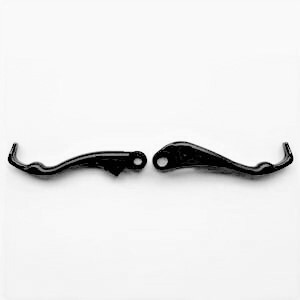 This change makes the installation of the crash bar and the servicing of the motorcycle quick and effortless. 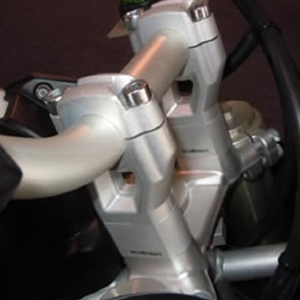 The Folding Gear Lever reduces the forces transmitted from the gear lever to the shaft in the event of an accident. 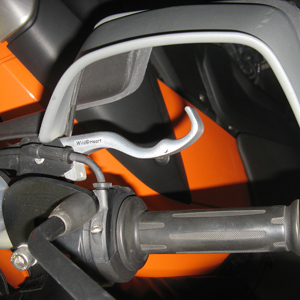 The spring loaded tip of the gear lever will also reduce damage if the motorcycle falls over. It helps to protect the gear lever, shaft and transmission. You need the following tools for installation: E8 Torx Socket and a 5mm Allen Key. Tools needed: Torx 30 and Torx 40 Spanner. Fit the BMW F650/700/800GS Twin. 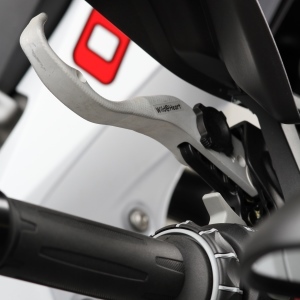 The main benefit of these levers are for the rider to have more effective and direct access to the clutch and front brake when riding without pinching the other two fingers when pulling the clutch. The Aluminium Two-Finger Levers are less prone to break when dropping the bike and more comfortable when riding off-road. A T25 Torx, 8mm Spanner, Hammer, 8mm Drill Bit and a flat Screwdriver is needed for fitment. Fits the BMW F800GS 2008+. Ideal carrier rack for your F800GS to carry soft luggage/camping equipment. The rack has been designed to also fit a RotopaX mount to enable you to take extra fuel or water with on your trip. You can still fit your soft luggage on top of the fuel/water pack. Made from black coated Aluminium. You will need a T40 Torx and 5mm Allen Key for installation. Fit the KTM 950/990/1190 Adventure. 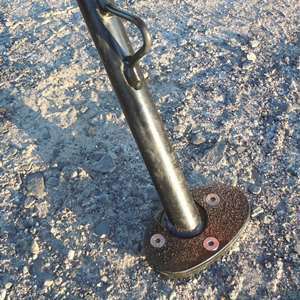 The pillion foot pegs enable the pillion to have a firm grip on the pegs while riding through difficult terrain, reducing the risk of falling. It also makes it more comfortable for the pillion whilst standing for long periods. The only tool you need is a pair of long nose pliers. 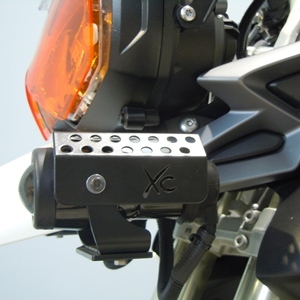 Securely fit your spotlights on your KTM 950/990 Adventure. The horizontal bar are neatly tucked away, protecting your spotlights. 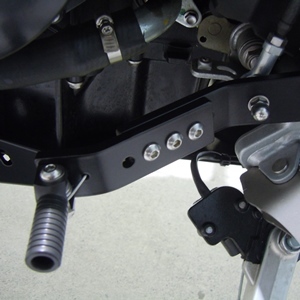 Existing mounting points on the motorcycle are used and no drilling is required. Use with the wiring harness to ensure an easy fit. Fit the KTM 950/990 Adventure. The Wild@Heart Crash Bars help to protect the engine, radiator and panels of the KTM against damage in the event of an accident/fall or side stand incident. Tools needed for fitment: 6mm Allen Key, 13mm Spanner and a 10mm Spanner. To make the use of the front brake and clutch more comfortable without pinching your fingers when using. Tools needed to fit: T25 Torx, 8mm Spanner and a flat Screwdriver. Fit the KTM 1190/1290 Adventure. Fits the KTM 950/990 Adventure and the 2013 KTM 1190 Adventure. The aluminium side stand support will ensure that your KTM stands firmly on uneven or soft surfaces like sand, even when fully loaded. To fit, use a Size 4 Allen Key and a bit of Loctite. Fits the KTM 950/990 Adventure. 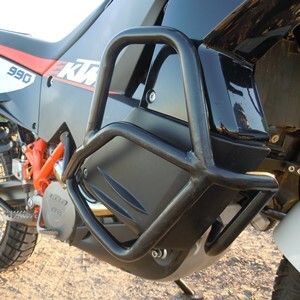 Ideal carrier rack for your KTM to carry soft luggage/camping equipment. The rack has been designed to also fit a RotopaX mount to enable you to take extra fuel or water with on your trip. You can still fit your soft luggage on top of the fuel/water pack. Made from black Powdercoated Aluminium. Fits the KTM 1190 Adventure 2014+ and KTM 1290 Adventure. To ensure that your KTM stands firmly on uneven or soft surfaces like sand, even when the motorcycle is fully loaded. Tools needed: Size 4 Allen Key and a bit of Loctite. Fits the KTM 1190 Adventure. The Triumph 800XC and 1200 Explorer are awesome (relatively) newcomers in the adventure motorcycle market. We have a few products available to make your motorcycle more comfortable for off-road/gravel trips. Fit the Triumph Tiger 800XC and 1200 Explorer. Tools needed: 8mm and 10mm Allen Key and a towel. Fit the Triumph Tiger 800. Fit the Triumph Tiger 800 and 800XC. 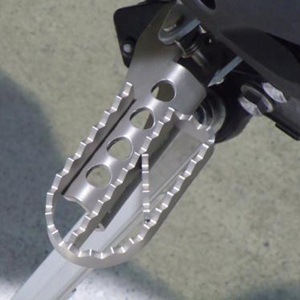 The wider rider foot pegs give the rider a firmer grip on the pegs while riding through difficult terrain, reducing the risk of his/her feet slipping of the pegs and falling. These pegs are extremely strong and also make it more comfortable for the rider to stand over longer distances. The only tool you need for fitment is Long Nose Pliers. 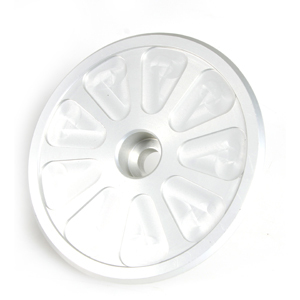 Suitable and adaptable for almost any type of fog or LED spotlight. 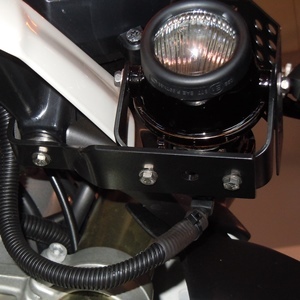 Use existing mounting points on the motorcycle, no drilling required. Protects and completes the fitment of your auxiliary lights. Use existing mounting points on the bracket of the fog light to fit. Although it is not essential to fit the spotlight covers, it protects and completes the fitment of your auxiliary lights. Made from Powdercoated Mild Steel. The spring loaded tip of the gear lever will reduce damage to the gear lever in case the bike falls over. It helps to absorb some of the force before it reaches the rest of the gear lever, shaft and transmission. The adjustable gear lever provides more options for different feet sizes to give the rider optimum riding comfort. Tools: 4mm, 5mm and 6mm Allen Key and a no. 10 Spanner. 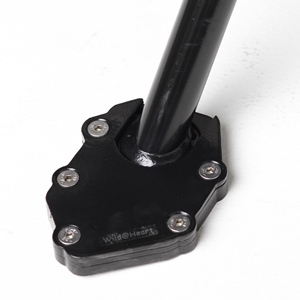 The side stand support gives the motorcycle a bigger footprint area when parking in sandy or uneven outdoor surfaces. 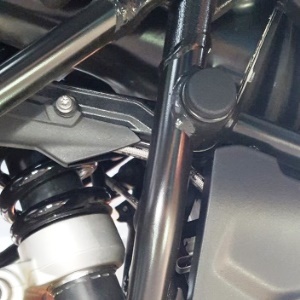 The design of the Side Stand Support is such that it will also work effortlessly and without interference with the after-market centre stand of the Tiger 800XC. You will need a 4mm Allen Key for fitment. An attractive black powder coated Aluminium carrier rack to provide space for soft luggage and camping stuff on the back of your Tiger. To make the rack more versatile, we made it compatible with the RotopaX mounting system and fuel/water bottles. Tools needed for fitment: T40 Torx and a 5mm Allen Key. Fits the Triumph Tiger 1200 Explorer. An attractive black powder coated Aluminium carrier rack to provide space for soft luggage and camping stuff on the back of your Explorer. The Honda Africa Twin 2016 is an awesome relevant newcomer in the adventure motorcycle market. We have a few products available to make your motorcycle more comfortable for off-road/gravel trips. Please send us an email for product availability and prices. We have a few products available for the Yamaha Super Tenere to make your motorcycle more comfortable for off-road/gravel trips. 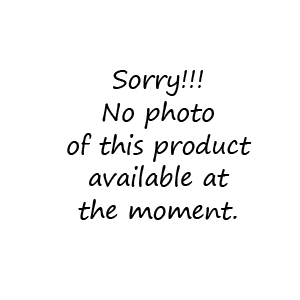 Please send us an email for product availability and prices. Oour primary focus is on accessories for BMW dual-sport motorcycles, but we also manufacture a selection of the most popular after markets accessories for some of the other brands. 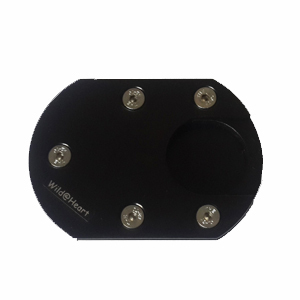 In addition, we stock, have access to or order in a wide range of other accessories from well-known international brands like Touratech, SW-Motech or Wunderlich and other local manufactured products as required. If you cannot find something for your specific motorcycle brand and model on our site, please email or phone us for a quote and to check availability. We are always willing to assist where needed or send you in the right direction.